At GenieMD our mission is to help improve the quality of human life by providing solutions that enable people to live healthier and longer. We are computer scientists and healthcare information technology veterans who are passionate about technology, and helping people easily access healthcare services, live well and take care of their loved ones. We strive to use all that is new in medical and computer science to build intuitive, comprehensive and easy to use solutions. 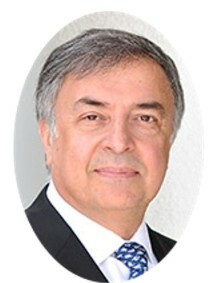 Dr. Soheil Saadat, Founder and Chief Executive Officer of GenieMD, is responsible for charting the company�s global course. He founded GenieMD in 2012 with more than 25 years of technology and executive management experience. In 2005 he founded Prodiance Corporation a global leader in enterprise Risk Management Solutions. Prodiance was acquired by Microsoft Corporation in 2011. Prior to Prodiance he founded Scientific Software, Inc., (SSI). Under his direction, SSI became a world leader in the chromatography and scientific data management markets, with its products deployed in the top pharmaceutical and biotechnology companies. SSI was acquired by Agilent Technologies (NASDAQ:A) in 2005. Prior to Scientific Software he held the position of Director of Software at Tencor Instruments (NASDAQ:KLAC). He is passionate about using technology to solve real life problems. CEOCFO: Dr. Saadat, what is GenieMD�? Dr. Saadat: GenieMD is a mobile health management solution that will help you better manage your health and the health of your family members. Dr. Saadat: We gather all of your medical information from all sources; from laboratories, self generated data and medical records. We then make the data actionable and shareable with your family care circle and health care providers. CEOCFO: Would you please explain the actionable part? Dr. Saadat: For example, let us say you help your Dad manage his high blood pressure and he measures his blood pressure on a daily basis using a smart blood pressure device. This smart blood pressure cuff syncs with GenieMD and when his blood pressure is outside of a doctor specified range. You get a notification on your iPhone and you can be proactive about this before it becomes an emergency situation. CEOCFO: How does the information get collected? How are you able to pull it from different sources? Dr. Saadat: That is a good question. For medical records, we bring data in through what is known as Blue Button Plus,a government initiative and set of guidelines to make your medical record data available to electronically. This means you can get your medical records through a secured pipe from your providers Electronic Health Record System to your GenieMD. We also interface with many smart devices such as FitBit, Withings, iHealth and many more. We also have a partnership allowing us to bring laboratory and imaging data to GenieMD such as blood tests, x-rays or CAT scans. CEOCFO: How far back are you able to go or is it more about starting today and adding the new data? Dr. Saadat: In most cases you can go back a few years. The way this works is that we provide you a unique GenieMD email address. During the registration process with a provider that supports BlueButton+, you specify this email address. Your medical records are then sent by the EHR to your GenieMD account. In some cases you can check a check box to receive your updated medical records every time you visit your doctor. CEOCFO: What is it that you understand at GenieMD that makes the process easier, faster, less expensive and better overall? What is the key to putting it together? Dr. Saadat: That is a good question. One of the most important differentiators of GenieMD compared to other solutions is that we believe that end users, the patients, should not have to enter any data manually. Therefore, to all of the extent possible, we gather data through electronic means or through smart devices, so the user does not have to enter data. Making data actionable is also a differentiator, we do not just simply store that data but make it available for the user to set reminders, or monitor progress by trending it. We want the user to derive insight into their health based on an aggregated data set, and use that insight to make healthy decisions everyday. Even if that decision is something simple like remembering to take a pill on schedule, over time these actions can add up to significant improvements in health. CEOCFO: Are people ready to accumulate their records, pay attention, keep it up or is it still a little bit outside of the norm? Dr. Saadat: We think that we are still early in the market; but the market is changing rapidly. We see this in the growth and success of wearable devices, tele-health and patient remote monitoring. Of course, the population is getting older. By the year 2030 twenty percent of Americans are going to be over the age of sixty five. The caregivers that provide care to the elderly are under tremendous pressure, both monetary and stress wise. They need tools such as GenieMD to better coordinate care of their loved ones as well as taking care of themselves. We have many parameters that are coming together to make this a product that will have wide acceptance by a large number of people. CEOCFO: Who is using the product today? Dr. Saadat: Our product today is primarily used by individuals that are managing chronic conditions such as heart disease, diabetes, or stroke. Along with tracking vitals and biometrics, many use the product more managing their medications, not only to be reminded to take their pills, but to conveniently refill their medication and find discounts on their prescriptions. We have a wealth of information about the health and exercise and the conditions that they use routinely. The next version of our product will also include many capabilities for the caregivers. Coordinating the care of the elderly is a difficult task. Usually there are multiple people involved. We will provide many capabilities for the caregivers to better manage the care of their family or friends they care for. CEOCFO: Are most people buying directly from GenieMD or are they referred by doctors or other providers? How does it work? Dr. Saadat: GenieMD is a free app that we are promoting through a variety of marketing channels. As a consumer, you can download it from iTunes or GooglePlay. We do have doctors that like the product and they recommended it to their patients download it. We also offer a licensed version for health systems or physician practices that are interested in customizing it for their patient population and deploying it with their brand on it. CEOCFO: What is the revenue driver for GenieMD or what will it be? How do you make money on this? Dr. Saadat: We private brand the product for the health systems for an enterprise subscription fee. The new care giver capabilities we are offering is based on very modest consumer-subscription model, where we charge a certain amount per month for you to batter manage the health of your loved ones. We are also in dialog with a number of mobile operators to offer our solution through their channels. CEOCFO: You offer some services as far as purchasing drugs. What are some of the add ons that you have now and that you may be bringing to the table? Dr. Saadat: The most significant feature in the upcoming release is the ability to bring medical and laboratory data into GenieMD. We already have a partnership with a drug discount company, where by showing the card that we give you for free you can get up to a seventy five percent discount on your medications. In terms of other capabilities, obviously we would like to better connect the patients to the clinicians. For doing, we are developing technologies for secure texting, secure video and secure email, so that we can comply with HIPPA rules. CEOCFO: What is the key to having a very user friendly app? Dr. Saadat: One of the important things about designing software is that you fully understand the audience and exactly what it is that they are trying to do with the application. To the extent possible we would like to avoid many layers deep of features, we would like to make things available to you at a maximum of three taps or clicks. In terms of the design of the screens, we also have people who have experience with human-machine interactions, know what part of the screen your eyes pay the most attention to, and down to what colors and fonts are pleasing to the eye. Best solutions are the ones that do not require an instruction manual. CEOCFO: You, personally, have considerable experience in technology and executive management and been involved with a number of companies. What have you learned in previous experiences that has been most helpful as GenieMD is growing and developing? Dr. Saadat: Generally in all companies but particularly in startups there are four things to watch for. First surround yourself with the best people that you can find. You do a lot of up front work in making sure that you have hired the right people, then delegate responsibilities and have checks and balances in place to ensure everyone is on the same page. Second thing is to run a lean and mean organization. When you have money everyone wants to give you money and when you need money, well it is always a challenge. Third is that time is always of the essence. You cannot procrastinate in small companies. Successful startups are usually built by people that give it 150% effort. Lastly, there is nothing that is more detrimental to the success of a company than bad quality. Therefore, we spend a good amount of time and effort making sure that first of all we design a system that is based on good, sound design practices and that the software will be testable. Then we spend a great deal of time quality assuring it, to make sure that it will withstand the test of end users. CEOCFO: How does the Affordable Care Act play into what you are doing at GenieMD, if at all? Dr. Saadat: We view any legislation that promotes consumer choice and encourages individuals to take control of their healthcare, as being in line with our objectives to empower people to take a more active role in the healthcare process. We believe that the HITECH Act, which similarly to the ACA, promotes interoperability standards and strives to advance the electronic exchange of PHI from a provider to a patient, directly plays into what we do at GenieMD. CEOCFO: Why is GenieMD a company to watch? Dr. Saadat: Our solution addresses a significant and clear and present problem. US and other countries around the world are facing significant healthcare challenges. In US 20% of our population will be over the age of 65 by 2030. Today, 35M baby boomers have at least one chronic condition such as heart disease or diabetes. Cost of healthcare is growing exponentially and there is going to be a shortage of doctors in US. In a few years half of the US population will be providing care for a family member and they need help. Recent government legislation is making an effort to address these challenges by aligning payment reform with patient outcomes and satisfaction and healthcare delivery systems are creating more patient-centric care models. However patients and their families still need electronic tools that enable them to more effortlessly participant in the healthcare process, to educate themselves, and to more seamlessly communicate with their support network. GenieMD is a comprehensive, easy-to-use, solution that fits seamlessly into any lifestyle and address all of these needs. We believe our vision of providing solutions to better engage individuals in managing their own health and providing them with tools to have holistic view of their health plays directly into helping solve the healthcare crisis. We have an experience team of computer scientists and health IT professionals. We have the experience of building successful software companies. We believe we are on a very interesting track to making GenieMD a great success.